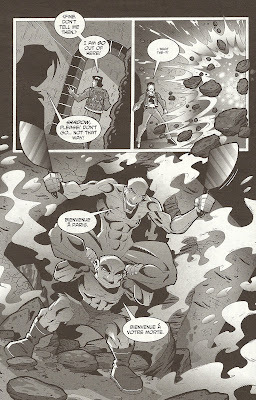 It's the further adventures of the Raphael and teenage Shadow team, last seen fighting werewolves together in Tales #7, as they encounter the supernatural. 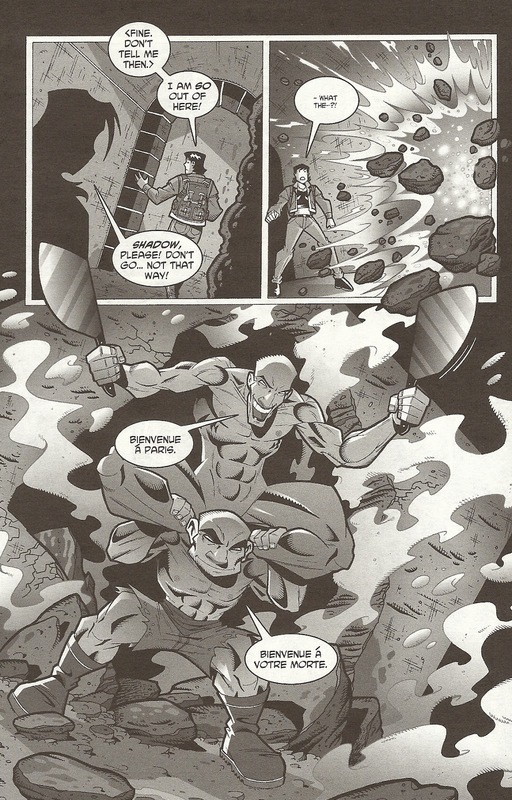 This issue is written by Steve Murphy and features art by Dario Brizuela over breakdowns by Jim Lawson. There's a big, rather irritating mistake in the transition from the frontspiece opening that all of these issues oepn with and the story itself. 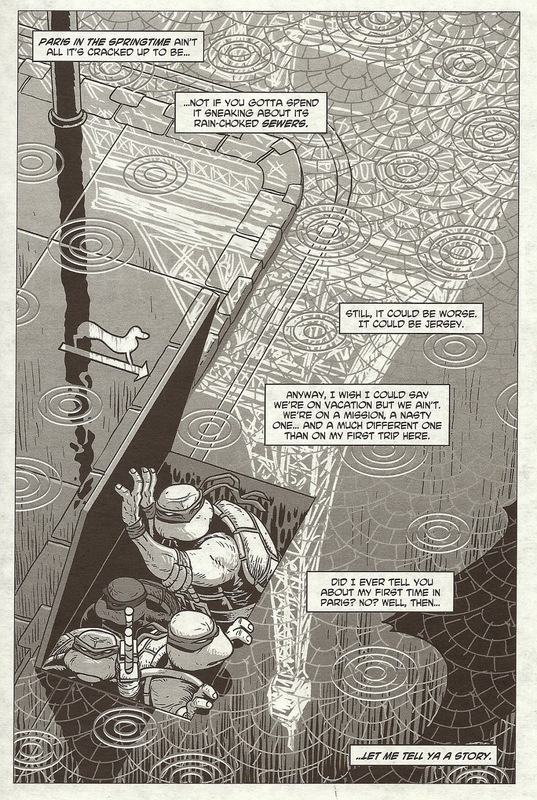 The frontspiece, a rather gorgeous illustration by D'Israeli featuring the four turtles in a Paris sewer, the Eiffel Tower reflected in the rain-slick street, has Raphael narrating, saying "Did I ever tell you abut my first time in Paris? No? Well, then..." before getting to the required "...Let me tell ya a story." 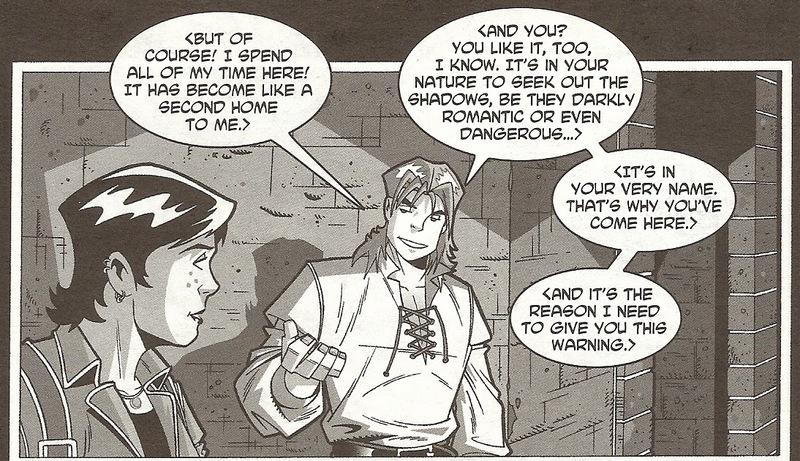 But when the story begins, we have an entirely new narrator, Shadow, who is on an Honors French class trip to Paris, and writing in her journal about how psyched she is to finally be free of Splinter, Casey, April and her uncles. Not that she actually is, of course. Raphael has stowed away on the plane, buried among packages and luggage, and sent to keep an eye on Shadow. 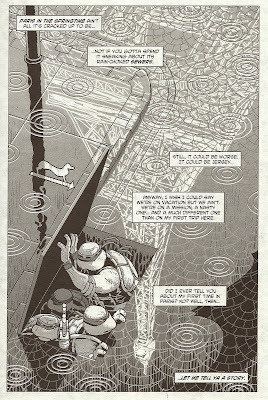 The Teenage Mutant Ninja Turtles in Paris, by the way, is a great idea for a Turtles story, given how big, old and exotic the world beneath Paris is; as far as sewers and subterranean environments below major cities go, it's pretty hard to beat that of Paris. Murphy and company, unfortunately, barely scratch the surface of this premise, as Raphael follows Shadow's class as it hits all the major tourist attractions by walking their itinerary beneath them, in the well-marked Paris underground. It's in one such underground tunnel that Shadow meets someone named Jean-Louise, who has long-ish hair and is wearing a peasant's blouse. 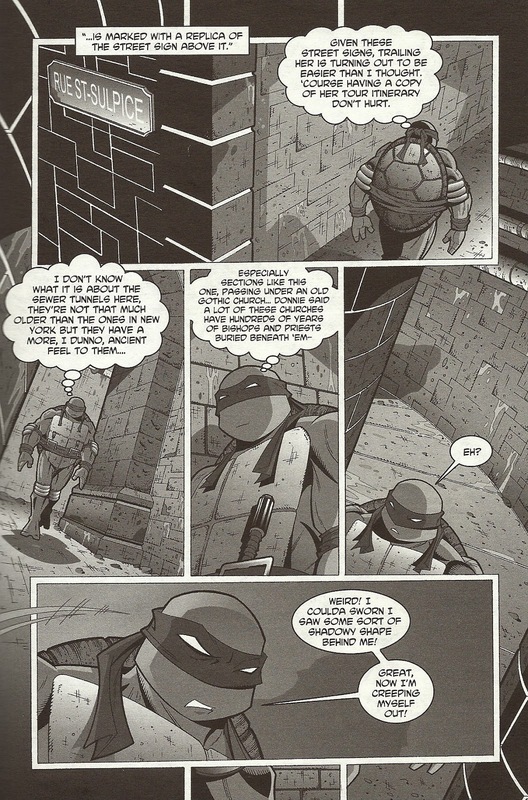 He warns her that her uncle should not have come to the city, which is the first she's heard of Raph's presence. 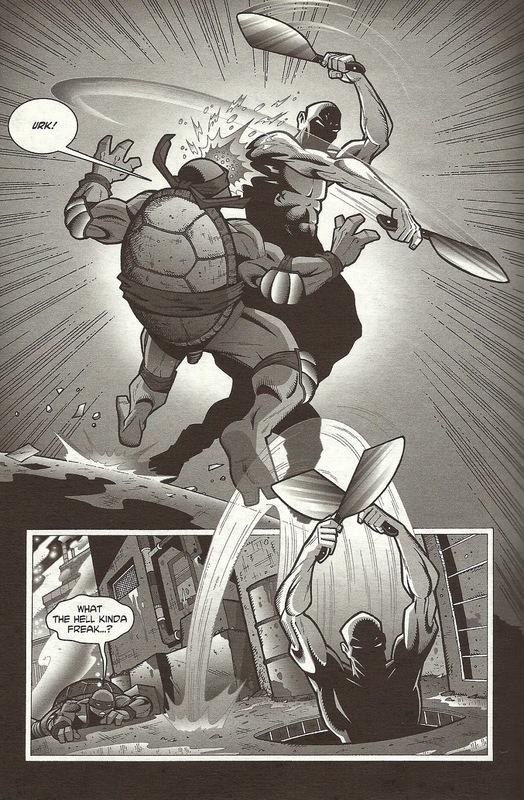 Meanwhile, Raphael encounters first a blade-wielding killer known as "The Beast," who cuts him, and then the local version of the cops, who assume the masked giant turtle man is The Beast, and proceed to shoot him. 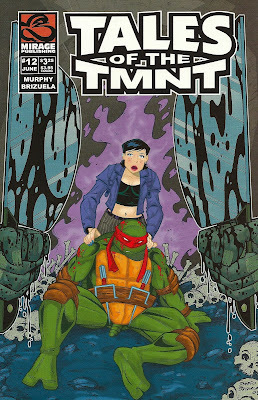 All parties—Shadow, Raph, The Beast, Jean-Louise the police—reunite in the catacombs for the climax, in which we see The Beast revealed for what it is for the firs time: A guy with huge blades, standing atop the shoulders of another guy (The placement of the logos on the front cover obscure Brizuela's depiction of these blades a bit, but we're essentially seeing a Beast's-eye-view of Shadow and Raph on the cover). The real Beast catches all the bullets in this encounter, while Jean-Louise disappears after saving Raph and Shadow. 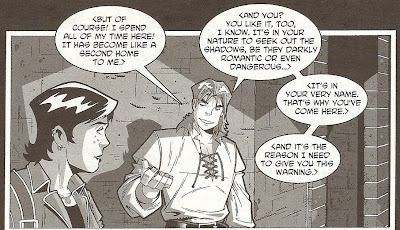 Who was that The Vampire Lestat-looking guy? Would you believe, a ghost? 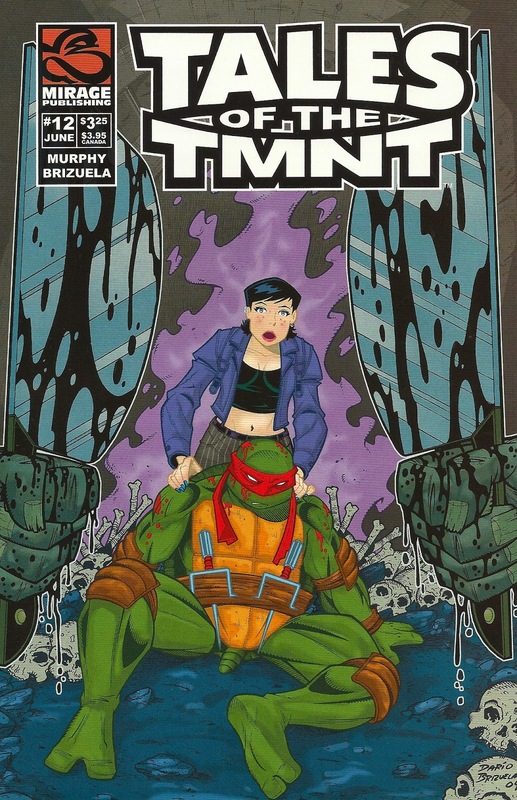 It's not the Brizuela's best work on the series (that would be Tales #1), nor is it Murphy's, but this particular issue does play around with some fun ideas. It doesn't make the most out of any of them, certainly, but it is by no means a bad comic, either.